OpenURL was devised to solve the "appropriate copy problem." As online content proliferated, it became possible for libraries to obtain the same content from multiple locales: directly from publishers and subscription agents; indirectly through licensing citation databases that contain full text; and, increasingly, from free online sources. Before the advent of OpenURL, the only way to know whether a journal was held by the library was to search multiple resources. An OpenURL link resolver accepts links from library citation databases (sources) and returns to the user a menu of choices (targets) that may include links to full text, the library catalog, and other related services (figure 1). Key to understanding OpenURL is the concept of "context sensitive" linking: links to the same item will be different for users of different libraries, and are dependent on the library's collections. 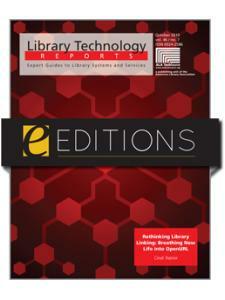 This issue of Library Technology Reports provides practicing librarians with real-world examples and strategies for improving resolver usability and functionality in their own institutions. Cindi Trainor is the Coordinator For Library Technology and Data Services at Eastern Kentucky University Libraries, where together with her awesome staff she plans for, implements, maintains and assesses technology in the libraries. She is the former Director of Library/Information Technology for the Libraries of the Claremont Colleges and spent several years at the University of Kentucky Libraries. 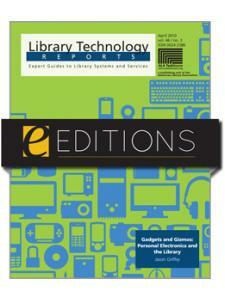 She is active in LITA and a proud member of the library geek community. She also writes and shoots photos for ALA's TechSource blog, is a co-author of The Darien Statements on the Library and Librarians, and is a photographer whose portraits have appeared in Library Journal, Digitale Bibliotheek and the New York Times. She wishes to thank her colleague, Cristina Tofan, for thoughtful feedback and moral support during the editing process. Jason Price is the Collections and Acquisitions Manager at the Claremont Colleges Library. He has a PhD in Plant Evolutionary Ecology from Indiana University Bloomington where he cut his teeth as a teacher and researcher before earning an MLS from IU-SLIS. After spending 10 years as a graduate student, he thoroughly enjoys applying his hard won analytical skills to current library challenges. His role as E-resource Package Analyst/Consultant for the Statewide California Electronic Library Consortium provides opportunities to work with publishers, vendors and libraries to improve products and increase pricing equity. He wishes to thank his colleagues on the OpenURL Evaluation team, who collected data for Chapter 3, and especially his family and coauthor for their forbearance throughout this ambitious project.